CPU : Intel Pentium P75, P90, P100, P120, P133, P150, P166, P200 and the 150, 166, 180 & 200MHz Intel Pentium Overdrive Processor with MMX technology. Optional USB Side-by side USB connector. Video RAM : S3 Trio64V+ motherboards have 1MB expandable to 2MB. This system has got 16KB Internal Cache (integrated into the CPU). Some systems come with 256KB External Cache soldered on the motherboard, and some systems come with no External Cache. Both revisions CANNOT be upgraded. 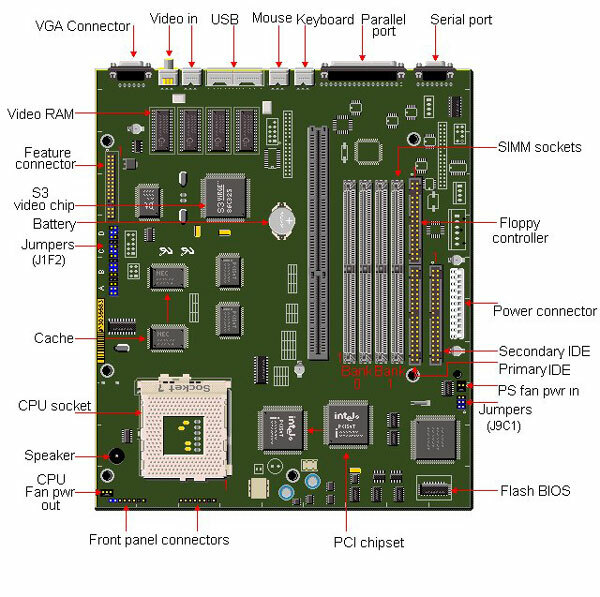 This motherboard can accommodate the Intel Pentium P75, P90, P100, P120, P133, P150, P166, P200 and the 150, 166, 180 & 200MHz Intel Pentium Overdrive Processor with MMX technology. - Some motherboards have a voltage regulator next to the CPU (ZIF) socket. These revisions can also accommodate a regular Intel Pentium Processor with MMX technology 166, 200 or 233MHz. If the motherboard does not have a voltage regulator, the system does not support the regular Intel Pentium Processor with MMX technology. The processors using MMX technology will only be recognised properly by the system if you have BIOS version 1.00.09DN0R or higher (the current BIOS version will appear on the screen immediately after switching on the computer). * The Pentium Overdrive Processor with MMX technology is equipped with an on-package voltage regulator, which adapts the 3.3V system voltage to 2.8V processor voltage. ** Some motherboards have a voltage regulator next to the CPU socket. These revisions can accommodate a regular Intel Pentium processor with MMX technology. To install the MMX processor use the jumper settings from the table above. The motherboard will automatically recognise the MMX processor and adjust the processor voltage. If the motherboard does not come with a voltage regulator on board, the system does not support the MMX processor! Warning: INSTALLING AN MMX PROCESSOR ON A MOTHERBOARD THAT DOES NOT HAVE A VOLTAGE REGULATOR MAY CAUSE PERMANENT DAMAGE TO THE PROCESSOR! If you upgrade the system using EDO DRAM SIMMS, the speed of the SIMMS can be 60 or 70ns. If you upgrade the system using Fast Page Mode DRAM SIMMS the speed must be 70ns for ALL Pentium systems. The SIMMS are 4/8/16/32MB 72-pin and can be x32 or x36 because the motherboard design does not require parity checking. Upgrade in pairs. This means you have to fill a bank completely. E.g. when up-grading the system with 8MB, you have to use two 4MB SIMMS instead of one 8MB. SIMMS in the same bank must be of the same type. Do not mix SIMM types within a bank. It is however possible to use EDO SIMMS in bank 0 and Fast Page Mode in bank 1. The video memory on this system can be upgraded to 2MB, by using two 256Kx16-50ns SOJ EDO DRAM chips.